For a long time, all I cared about was my career; my loved ones obviously always came first, but you guys know what I mean. I was working myself to death – only getting 3-4 hours of sleep per night, skipping meals, passing on workouts, and all that good (and by “good,” I mean bad) stuff. And the messed up part was that I was proud of it. I was proud of being half-dead because I thought that meant I was hustling hard. My motto was, “suffer the pain of discipline or suffer the pain of regret.” Now, I still live by that because I believe sacrifices ARE necessary, but I’m making it a point to LIVE as well. I’ve been lucky in the sense that I haven’t lost anyone SUPER close to me, but I recently had a bit of a scare. Someone extremely dear to me tested positive for pre-cancerous cells, and I honestly don’t think I’ve ever been more afraid. I felt like I was losing my mind – I couldn’t sleep for weeks because I was consumed with worry, and I felt like a zombie during the day. Luckily, everything turned out to be ok, but the whole situation made me re-evaluate my priorities. It helped me realize how precious my health was, and it made me want to live life to its fullest. I know it sounds cheesy and cliche, but I’m being 200% real with you guys. There are SO many things I want to see and do, but work always seems to get in the way. I’m determined to change things though. I refuse to believe that I can’t have both. I mean, there’s a reason why “work hard, play hard” is a popular saying, right? So, my mission for SS has now officially changed. In addition to my current lifestyle posts, I’m going to place a HUGE emphasis on fun things to do in the area or on the road. And through my adventures, I hope I can inspire you guys as well. Anywho, I apologize for the long-winded intro. 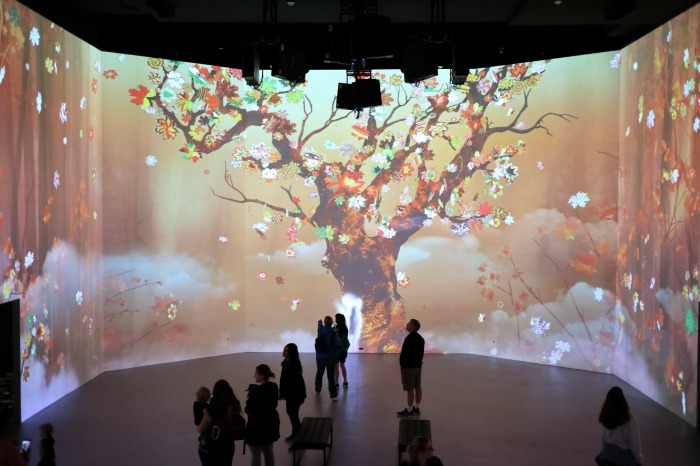 Without further delay, let’s get to the heart of today’s post: Artechouse’s “Spirit of Autumn.” Located in DC on 1238 Maryland Ave SW, Art + Tech House showcases immersive large scale works. I don’t know if you guys remember, but I covered their XYZT: Abstract Landscapes a while back. They totally wowed me and my bf back in June so I was beyond pumped to check out their latest. Although I really enjoyed interacting with the art, XYZT was better IMHO. There was more to play with – SOA only really had 4 different areas, but before we talk more, I want to show you guys a video I put together (footage by Sung Shin). For those of you interested, Spirit of Autumn has two viewings (daytime vs evening). Daytime tickets (from 10-4PM) cost $12 a pop and $8 for kids, students, seniors (65+) & military. Evening admission (from 6-10PM) is $20 per person and is only open to adults 21+. Each ticket is good for ONE hour, and I recommend purchasing them online. Alright guys, that’s it for today! What did you guys think of the new Artechouse exhibit? Would you go? Make sure you let me know by leaving a comment below. I’m so glad you posted this! I’m thinking about going on Saturday. The exhibit looks really cool! Also, I really enjoyed reading your heartfelt introduction. It really opened my eyes on things that I never thought about before. Thanks =) Hope you have a lovely week ahead of you! Waaw,.. beautiful room,.. Couldnt decide which room is more beautiful,.. It was all so much fun!